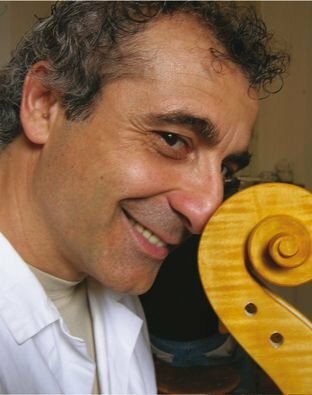 He was born in Cremona in 1962 and graduated from the International School of Violin-Making in Cremona in 1982 under the instruction of Maestro Morassi. For four years he worked in the workshop of Maestro Giorgio Scolari and participated in numerous competitions such as those of Baveno, Bagnacavallo, Competition of the American Violin Society, USA, and the Cremona Triennial. Since 1996 he has been a teacher of practical workshop and varnishing at the International School of Violin-Making, where he is also responsible for the organological museum. He took part in numerous educative projects, especially those of “S.comp.a.r.s.o.” (Complementary Study of an Antique Original Stradivarius Exhibit), the “Tancredi" project (reconstruction of instruments from the baroque era), and the "Inlaid Instruments". He has been a member of numerous commissions in the educative framework and in collaboration with the Center for Professional Training of the Cremona Province. Since 1991 he has been working in his own workshop in Cremona, where he dedicates his time to the construction of instruments according to the forms of the classical Cremonese school.